For most uses, chefs prefer stainless-steel cookware to nonstick cookware. When stainless steel is wrapped around an aluminum or copper core, it will heat evenly on gas or electric stovetops. Experts also say it does a superior job of browning food -- and the resulting fond (which is French for "base," and refers to the little brown bits that stick to the pan bottom) can be used to create delicious sauces. Still, stainless does have some drawbacks. Since these cookware sets are not nonstick, cooks have to use more fat or oil to prevent foods from clinging. There is also a learning curve to mastering cooking with stainless steel, experts and experienced users note, but once you have it down it becomes much easier to do. Because food sticks more easily to stainless-steel cookware, it can be harder to clean. Most experts recommend using either baking soda or a cleaning product such as Bar Keepers Friend (Est. $7 for 12 ounces). From personal experience, we can tell you that filling the bottom of the pot or pan with hot, soapy water and then letting it soak for an hour or so makes cleanup easy-peasy. Still, if you prefer the absolute least amount of hassle (and who can blame you? ), you may want to shop instead for nonstick cookware, which we cover elsewhere in this report. In professional tests of stainless cookware, All-Clad is the absolute top performer. 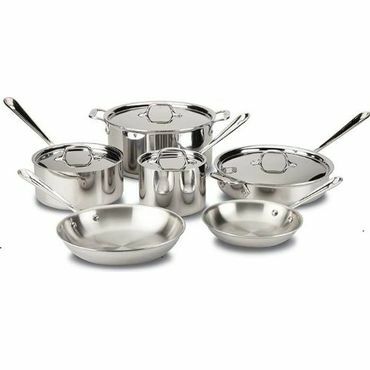 All-Clad does not make cookware sets, per se, but they do sell sets to various retailers under different names and model numbers. The All-Clad Stainless Steel 10-Piece Cookware Set (Est. $700) is one of the top-rated stainless steel cookware sets on Amazon.com and elsewhere, as well as being rated a top performer in testing at TheSweethome.com and at another professional kitchen product testing site. There are also a number of tests of individual pieces made of the same construction that also bubble to the top in expert roundups. We can extrapolate the results of testing on individual pieces to this set, especially with the high praise it receives from users. Owners say these pans aren't just pans and TheSweethome.com calls them a "buy-it-for-life cookware set." While the initial investment is high, if you do the long-term math the value becomes clear: figure you'll use them every day for 30 years or more, and then pass them along to your children, you'll more than get your money worth. Avid cooks say All-Clad pans make any cooking task easy, with excellent, consistent heating, claims that are bolstered in the aforementioned professional testing. Even those who describe themselves as average cooks say these pans take their cooking up a notch. All-Clad gets particular raves from those with induction ranges. Owners say the long handles on this particular set do not get hot and they are attractive enough to leave out on display. The set includes an 8-inch fry pan, 10-inch fry pan, 2-quart sauce pan with lid, 3-quart sauce pan with lid, 3-quart sauté pan with lid, and an 8-quart stock pot with lid. Experts say these offerings are on the small side for a normal-sized family, but we saw no complaints about the set's contents from users. In spite of All-Clad's universally glowing reviews, not everyone can afford to spend that kind of money on cookware. The great thing is you can get pretty close to All-Clad quality without paying All-Clad prices. It's a fraction of the price of All-Clad, but the Tramontina 8-piece Stainless Steel Cookware Set (Est. $120) does nearly as well as All-Clad in the same two professional tests we mention above. In fact, it's the top pick at TheSweethome.com; ranking just behind All-Clad in a couple of metrics, but close enough that they note the Tramontina 12-Piece Cookware Set (Est. $300) that they recommend offers "the biggest bang for your buck." We recommend the eight-piece set for most kitchens, but the 12-piece set would be a great choice for larger families or those who cook enough to like a wider range of pan types and sizes. The eight-piece set includes 8- and 10-inch fry pans, 2- and 3-quart saucepans with lids, and a 5-quart Dutch oven with lid. The 12-piece set includes larger 10- and 12-inch fry pans, 1.5- and 3-quart sauce pans with lids, a 5-quart sauté pan with lid, a 5-quart Dutch oven with lid, and a 12-quart stock pot with lid. While Tramontina very closely matches All-Clad in cooking performance, design and construction, its biggest drawback is that the pans get more complaints about food sticking than with All-Clad, and one professional testing organization gives it just average grades for cooking evenness, and poor ratings for ease of cleaning. However, most owners are very, very happy and don't see the sticking issue as a problem. The set is primarily sold at Walmart, and it gets very high ratings in owner reviews there -- including for ease of cleaning in spite of the professional testers' findings. In many of the negative reviews we saw, it was apparent that the users did not allow for the learning curve that cooking with stainless steel requires. Another popular option in stainless cookware that does well in professional testing is the Cuisinart MCP-12N MultiClad Pro Stainless Steel 12-Piece Cookware Set (Est. $240). TheSweethome.com makes it their runner up pick, saying, "This reasonably priced set gives you most of the cookware you'll need in your kitchen." Testers there also praise the Cuisinart's durability and balanced weight. It includes 8- and 10-inch skillets, 1.5- and 3-quart saucepans with lids, a steamer insert with a lid, a 3.5-quart skillet with a lid, and an 8-quart stockpot with a lid. Owners love the Cuisinart 12-piece set, making it one of the top-rated stainless steel cookware sets we evaluated. Many compare it favorably to All-Clad, saying it performs just as well at a price that's much more realistic. It also gets high marks for durability, with a number of reviewers weighing in after 7 or 8 years to say their sets still look like new. Like all stainless, it gets its fair share of complaints about food sticking. So, with the great reviews and great value behind our budget picks, why buy All-Clad? Because it's made in the U.S., so the quality is likely to be high, and U.S.-based customer support is available if you have questions or if something is not up to snuff. Also, professional chefs, expert cookware reviewers and amateur foodies agree that you should always have the best tools you can afford. So, if you can afford All-Clad, you should get it and then pass it along to your children. If not, the Tramontina set just squeaks by the other runners up in professional tests to take our top spot as a great budget choice.